This goes double for soldiers and sailors who regularly worked and fought in the mud, tar, gunk and grease of the world of old. Months on end on campaign would really take its toll on your uniform, even if there were dedicated people in the unit who did nothing but laundry. And have you ever seen a proper period laundry demonstration? The beating that the garments got was brutal. Next time you're at an event and get a little dirt on your elbows or knees, let it stay. Facial hair was either 'in' or 'out' depending on what time period you reenact. If you're doing a time period where facial hair wasn't the thing, shave it off... conversely if you're doing a time period where beards were the thing, grow it out. 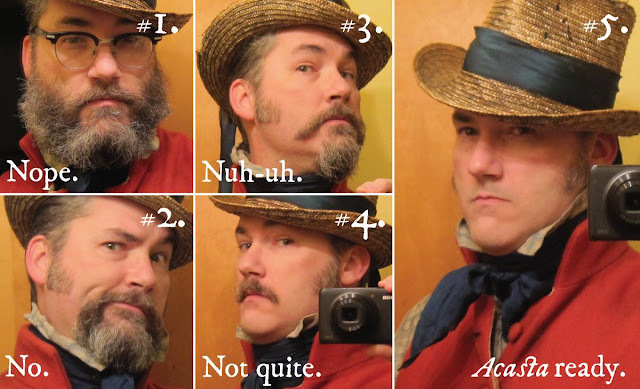 Facial hair, or the lack thereof can go a long way toward improving the authenticity of your period appearance. Razors are easy to lay hands on... and facial hair isn't all that difficult to grow back between events. Okay so I get that not every event is geared for this sort of interpretation, and honestly, not every guest or visitor to a historic site is going to be up for this either. But if they ARE, you should give it a try. It's a lot of fun and a great way to get outside yourself for a little while and come just a smidge closer to the period by portraying someone from the era. I'm liable to make a few enemies with this one, but haversacks weren't generally worn by civilians to carry your stuff around in (like a modern purse or messenger bag). Haversacks were primarily used by soldiers. Need something to carry your stuff in? Make a simple market wallet. Baskets are also good. The best way to improve your reenactor game? Reading. 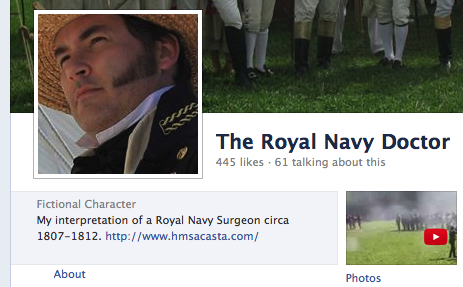 Read everything that interests you about the time period you portray. It will serve to teach you new aspects about the period you enjoy, or even refresh your memory about things you read long ago that you'd forgotten. Don't 'plateau' or get stagnant, don't be rigid in your interpretation, always be learning and working toward new and interesting things... and remember to always be as accurate as you can be. You might be the spark that ignites an interest in history for the next generation of historians, museum professionals or reenactors! Do you have any easy suggestions for reeanactors to improve their impressions? Please feel free to share them in the COMMENTS section, we'd love to hear your ideas! If you have enjoyed reading this or the other adventures of the HMS Acasta, be certain to become an honorary member of the crew. This is a easy way to show us that you're out there and paying attention. If you find a post that you are particularly fond of... be sure to share a link with your friends, over Facebook, Tumblr, Google Plus, etc. so they can enjoy it too! Oh, grubby trousers... I seriously love my oldest pair of 'white' trousers - they're a kind of grubby yellow colour with ingrained dirt on the knee... the easiest ever way to get them looking authentically dirty when in camp is to wipe your hands on them after you've tended the fire. And believe me, they look whiter in photos than they do in real life. Get your clothing right. 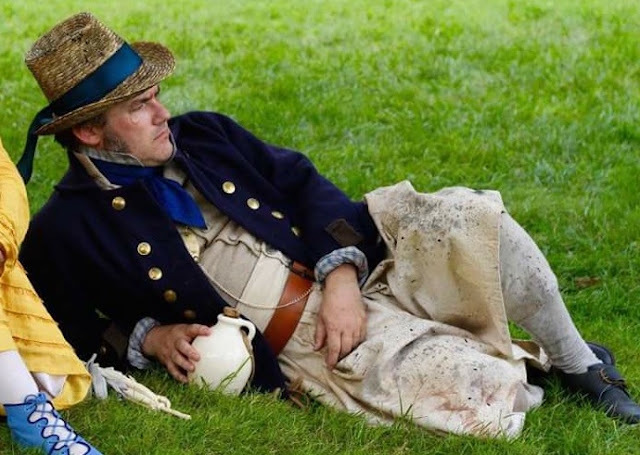 I cannot tell you how many times I have seen upper-class 'ladies' at Napoleonic-era events wearing what amounts to evening dress, in the afternoon in a camp/bivouac environment. And for the men: wear your trousers shorter than you would wear your modern trousers. Soldiers' trousers, if worn over their gaiters, ought to show the bottom two gaiter buttons. It looks all sorts of wrong for period trousers to come down as far as the shoe, when those trousers are the loose working-class style. Lower-class women: It is legitimately OK for you to wear a regimental jacket picked up off the battlefield - it just shouldn't look like it's brand new. The women of Wellington's army were just as proud of 'their' regiments as their menfolk who actually mustered in the ranks. Think about what level of society your persona belongs to and ensure that the things you have, from your clothing to your personal effects, convey that - and if you have something that ought to belong to someone from a higher station in life, have a very convincing tale as to how you came by it (whether legitimately or not - and sometimes 'not' is the more fun). Glasses. Not worn by many people at the time except for reading. If they are really needed Jas Townsend and sons carry a full line of period correct frames nothing looks worse than modern glasses. 2 does apply to most periods that I know of. People just didn't need to carry stuff around all the time. So just ditch the bag--unless it is to carry lifesaving meds, you don't truly need it at an event. I can't wait to be a filthy, beardless, haversack-less sailor lad with you grimy lot in July! Another thing often ignored is the appearance of dyed clothing and other fabrics. Artificial dyes did not come into use before 1859, when a young English chemist accidently made a purple dye from coal tar (of all things!) while trying to make artificial quinine! Cocheneal, made from little red bugs from Latin America made red, but depending on what mordant was used, the red could be brilliant scarlet to almost a purple/red. The cheap alternative (especially for enlisted men's coats) was Madder root, which again gives various shades depending on the mordant. Green could be done with "Poke berries" but more commonly was done by dying with saffron and overdying with indigo. We still use indigo on blue jeans because it fades and faded jeans are "cool" and the color of a green coat, after a year or so in sun and rain etc. must have anything but the original green. Mud/yellow? Anyway, this is an entire different line of research for someone to follow. I think footwear is also very important: authentic repro shoes/boots are available and really add that final touch...nothing worse than seeing a great impression then the eye goes down to-horrors -a pair of crocs!!! !